Nostalgia and a sense of deja vu haunted me as we touched down at the Jomo Kenyatta Airport, in Kenya. I was returning home after 38 long years, family in tow; a dream that I had nurtured for years. The very words Masai Mara conjure images embedded in the mind since my childhood; images of prides of lions lazing under acacia trees and cheetah's making their spectacular forays chasing impala through the lush golden savannas. 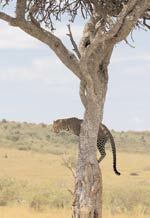 Add to that the classic African image of a leopard with a kill, staring out from an talllimbed tree. The tree was a symbol of much of what Africa stood for in my mind's eye since my teenage years, and since, has remained a potent motif that I keep referring back to. This vacation was very special in more ways than one. Not only was I returning to a country where I was born and discovered my love for the wild, but I was getting a chance to show off the shared history between me and Africa to my family. The spectacular game parks that we were going to visit were I knew, some of the best and most special in the world. 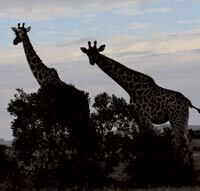 Girraffes towering over the Masai mara savannas at sunset. Our safari vehicles met us at the airport and I personally feel this is the best and perhaps the only way to travel across the Mara. Depending on weather conditions, it takes anywhere upwards of 8 hours to get to your resort. The drive acquaints you with some of most humbling and breathtaking terrain you will see anywhere on earth. From the Great Rift Valley escarpment to the undulating fertile highlands lakes and even dormant volcanic craters, it's all part of the great African story. The road after Narok gets pretty rough. Thankfully, we are in four-wheel drives. The large stretches of corrugated roads are bone rattlers and when we drove across this stretch, it had just ceased raining and stretches of the road had turned into skid pans. For those who would rather appreciate the expanse from the comfort of an aircraft, all it takes is a 30-minute plane ride from Nairobi's airport to the region. ..There are regular Air India and Kenya airways flights from Mumbai to Nairobi. ..Yellow fever shots are a must. Take them at least 10 days before your departure date. ..The Masai Mara and other parks have a wide range of safari lodges and tented camps. The Serena and Sarova chain of hotels are reccomended. Mara Timbo has luxury private tents. ..Kenya has temperate climate through the year. Nairobi has cool nights and moderate temperature during the day. You need a quilt by night. ..No samosa in the world can match Kenya's sumptuous keema samosa and maru bhajia's with tamarind sauce. This is washed down with fresh passion fruit juice. Ugali, a local delicacy, is also worth a try. 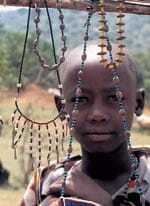 The Mara is the ancient hunting grounds of the Masai and is now a Masai reserve. The grassland ecosystem stretches across the border into Tanzania's Serengeti National Park. 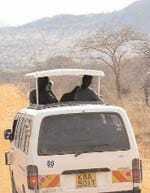 The Kenya-Tanzania grassland game park reserve covers an area of roughly 25,000 sq km. Every year in July and August, the Masai Mara turns into an arena for nature's most spectacular and powerful drama to unfold. It is here that you can be part of the largest animal migration on Earth. The ground begins to rumble in a deep, rhythmic baritone, as millions of hooves move across the savannas. As dry weather sets in, nearly two million wildebeest, gazelle, and zebra, flanked by pursuing predators, thunder across the Serengeti to cross the crocodile infested Mara river into Kenya's Masai Mara. Wildlife is concentrated in the Mara from July to October, and across the border in Tanzania's Serengeti from November to June. The Masai have lived here for centuries as warriors and hunters, but now live in harmony with the wildlife as pastoralists. They no longer hunter lions and wild game as they once did. We sat in stunned silence through this almost ritualistic journey to the heart of the Mara. The private resorts located here are well managed and ideal for a family holiday. In spite of being next to the Mara River, and contrary to the mumbo-jumbo that keeps unadventurous city folk away from continent's such as this, I did not get a single mosquito bite. As we settled down for the evening, our hearts beat to the collective rumbling thunder of lions calling out to each other. For me, this evoked images and memories that i had buried deep into my soul when I left for India as a young man. The smell of smoke from the campfire too had that familiar scent, long forgotten. It was a unique experience and more than once through the evening, I felt transported, almost pulled back into the past. 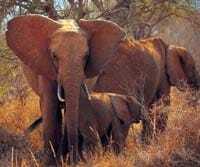 The wonder of Africa is the access to beasts of all shapes and sizes. Lions are a star attraction here and it is easy to find a pride of even a dozen sprawled under a shady tree, oblivious to the world. A family of cheetahs at a kill in Masai Mara. Drives through the Mara can last the whole day, but during the migration period it's best to head straight for the Mara river crossing points. A local guide is invaluable and can save you time by taking you to the prime spots without delay. At the crossing points you get to witness the most amazing drama coming to life, and even hours later, you find it difficult to tear yourself away from this grand arena where nature enacts its primordial dance of life. Hundreds of wildebeest zebras and antelopes plunge over the steep slopes of the Mara. Tension mounts high as the nervous herd, sometimes 5000 strong, is spooked by the waiting crocodiles on the other side. The vultures are not far behind, nor are the hyenas; all predators and herds waiting for some invisible signal for the crossing to begin. All of a sudden, a male takes the lead and plunges down the slope. The rest follow in ribbon elasticity, almost stumbling over each other as they race down the steep inclines. Some land safely and plunge into the river while others tumble and slip, bringing down a few others in the mad melee that follows. The river is swamped by hundreds of frenzied animals desperately swimming toward the safety of the other bank. Some unsuspecting ones are snapped away and pulled underwater by waiting crocodiles, while others are trampled as the nervous herd gallops toward safety, leaving a feast for the eager scavengers. Once across, the herd heads for food and the safety that the tall grassland and plains offer. It is estimated that almost 300-400,000 wildebeest zebras and antelopes die every year during the migration but an equal number are born in the Serengeti plains. 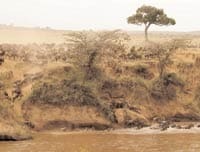 The Mara turns into a river of death as bloated carcasses and feeding vultures litter the river. This is the dance of life; nature's dynamic cycle of interdependence that has been going of for millions of years. As the sun dips low, the park turns in to a sheet of gold, the cool air and the fragrance of the Mara drifts to you. Nothing beats this extraordinary experience, with the smell and sounds and the air of "majani wa mutoni" (smell of the wild grassland) engulfing you. After the Mara river, the first place I usually drive to is Cheetah Hill, my favourite haunt and a filmmaker's delight. The majestic cat with its cubs posing on mounds or anthills is a special treat for first-timers. As the nocturnal world begins to stir, predators call out to each other and fan out, looking for a possible quarry amongst the thousands of zebra, spotted hyena, jackal, hippo, giraffe, eland and scores of other species which inhabit the Mara. We also visit the Tasavo and Amoseli National parks where I went looking for my favourite animal, the most majestic and magnificent African antelope. The beautiful creature, the Kudu, with its spiralling horns, which can grow up to 70 inches is for me the ultimate creation. Unfortunately, pursued for decades by trophy hunters, for its prized horns, its population has declined alarmingly and it is now endangered. The Mara is a landscape replete with beauty, ingenuity, honesty and devastating beauty. It is God's own country, and as I take a last look at the landscape that will forever be home to me, I find myself feverishly praying that it never loses its soul. Time stands still at this edge of the Dark Continent and when the wildebeest begin to migrate, there is finally light.